Emerson students await entry after evacuation. Students in the Little Building were evacuated Wednesday for what was later determined to be a false alarm. 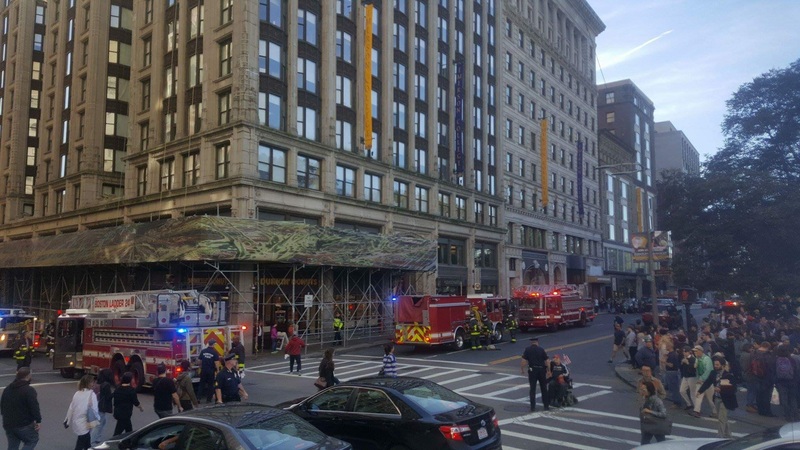 At 2:45 p.m., Emerson’s Emergency Notification System warned students of a possible fire on the fifth floor of the Little Building. Students on the fourth, fifth, and sixth floors were evacuated. Those on other floors were recommended to take shelter where they were. Around 20 minutes later, ENS confirmed that the Boston Fire Department secured the building. There was no fire. An overheated air conditioning and heat air intake system triggered the alarm, according to the ENS. Students reported smelling and seeing smoke. Elissa Chojnicki, a graduate communication studies student and a residence assistant on the third floor, said she went to the fifth floor and found it was filled with smoke. “It basically just smelled like a microwave had blown up,” said Shelby Renjifo, a sophomore visual and media arts major was on the floor. The Boston Fire Department could not be reached for comment.